A Crime Called Freedom by Os Congaceiros is now out of print seemingly with no second print run coming from Eberhardt Press. The highly anticipated second volume translated by Wolfi Landstreicher is canceled as well. As this was, in our opinion, one of the best books that Eberhard produced, it seems odd. However the contents of the first volume and some of the second are now available to download. At some point a critique of some of this is in order, because these occupations are only interesting when they go outside of merely being “actions” that address a growing assemblage of issues regarding the management of capital. Certainly there are people within this who share a similar critique and are attempting to push these struggles past their allotted boundaries. Although what is at issue most importantly about the generalization of an antagonistic practice is the possibility that while in the process it deconstructs the separate categories of student, worker, individual, etc, rather than reifies them further. 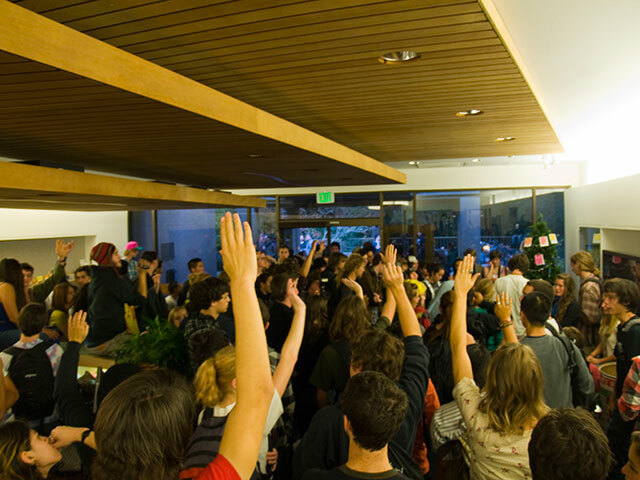 Do we dare flirt with student activism? Or is it something to hide within? Maybe a temporary invisibility cloak? There are some people who want to only see activism and apply the traditional anti-political critique. It’s so easy. But what they miss is the student acting. And in this acting lies the possibility of their no longer being simply students. On a tangential note, there is a tendency of much writings coming out of the recent student movement to appropriate situationist jargon, which then has an emptying relationship on the concepts themselves. As the SDS activist so often thinks to don the fatigues of the leftist guerrilla as did their 1960s predecessors whose image they have brought back from the dead to build the organization, the more sophisticated activist speaks in anti-activism and pro-situationist jargon. They read The Coming Insurrection in an attempt to use new words to give life to practices that will always be dead. Maybe this is too harsh? There’s plenty of room for both excitement and suspicion. Could we be so naive to think of conflict not as a force developing, but of another tendency to critique? While at the same time it seems the only space left where anything interesting or new can happen is built within a healthy pessimism and hostility. Where there is nothing left for us but a shared total hostility to our conditions we can finally be constituting of something different. 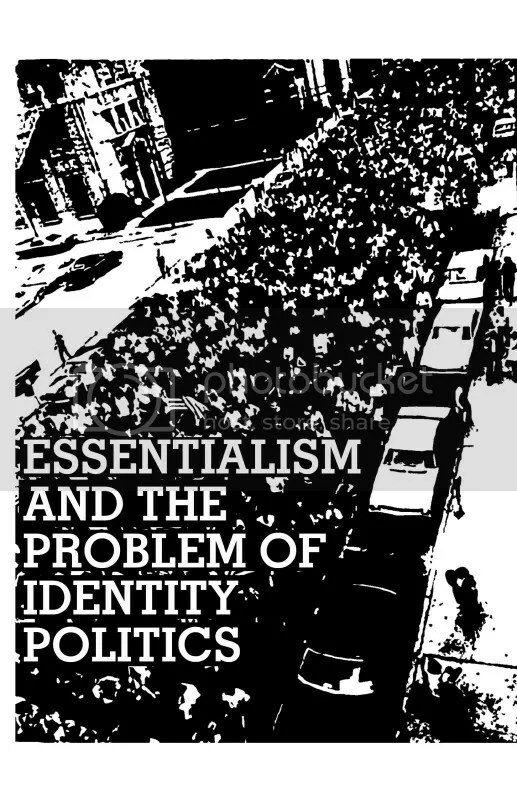 “Essentialism is the idea that there exists some detectable and objective core quality of particular groups of people that is inherent, eternal, and unalterable; groupings can be categorized according to these qualities of essence, which are based on such problematic criteria as gender, race, ethnicity, national origin, sexual orientation, and class. These external qualities are almost always marked by visual cues, making the categories more obvious and/or easier to notice. These qualities contain social and — more importantly from an antiauthoritarian perspective — hierarchical significance to those marking the cues and those marked by the cues: sexism, in the case of gender; racism in the case of skin tone; the unwanted attention of authorities in the case of any and all different looking/acting people. Racism, sexism, classism, and most other forms of historical oppression are ideologies and policies maintained and justified by essentialism. “This is a first posting on the developing situation in Athens where the 36th anniversary of the Polytechnic Uprising against the colonels’ junta has been marked by long and sustained battles with the police during which hundreds of people have been detained. 21:30 17 November 2009 At the time of writing all central Athens is off-bounds and cordoned off by thousands of police forces as battles between protesters and police are developing after the end of the 36th anniversary march for the Polytechnic 1973 uprising and massacre. It was perhaps the most massive protest march commemorating the Polytechnic Uprising in the last 25 years. And despite guarantees from the government the presence of the police in the city of Athens was massive and provocative to the extend that the official organising bodies of the march refused to start their long way via the Parliament to the American Embassy (believed to be behind the 7 year fascist junta) if riot police forces did not withdraw. After 16:00 policemen arrested a young man claimed to be in possession of a molotov cocktail, while during the hours preceding the march a dozen of protesters en route to the Polytechneio were detained for carrying gas masks. Police blockades have sealed off large areas of the Athens centre and are all day conducting mass stop and search operations even in the remotest northern and western suburbs of the city. The march started moving at 16:30, shortly stopped at Syntagma square to commemorate the police assassination of two protesters in the Polytechnic march of 1980, while with some tension built up uproad, at the junction of the Athens Hilton, at 18:15 when riot cops threw a tear gas in the midst of the march attempting to break away the anarchist block. The tension was quickly diffused. The first block of the march reached the American Embassy at around 18:00, where hundreds of riot policemen stood in line guarding the building. After the traditional long stop, the march started dispersing in large blocks. At that time, the anarchist block numbering between 2,500 and 4,000 people (still the numbers are unverified) decided to return to Exarcheia via Alexandras Avenue where the Athens Police Headquarters Tower and the Supreme Court are lined. Upon reaching the Police HQs, the big anarchist block was cut in two by riot police forces, leading the protesters to counterattack against the cops and the glass-n-iron symbol of repression with rocks and nautical flares. The clashes initially forced the police forces to retreat and continued until outside the Supreme Court, with smaller blocks breaking up in the side-streets. Soon after 19:00, under unspecified circumstances, a 100 strong block of protesters was surrounded at the junction of Alexandras avenue and Spyrou Trikoupi street by large riot police forces that immobilised them and brutally detained them. There are reports of people seriously wounded, as well as of two journalists (one working for the French press, and one for the radio-station Kokkino) detained or arrested. The bourgeois media claim that the people detained were unrelated to violence against the police. Meanwhile protesters that had managed to reach Exarcheia square engaged police blocking the way to the Polytechnic in battle with use of rocks and molotov cocktails, forming barricades. The area is surrounded by police forces and off bounds even for state and bourgeois journalists. At the same time Exarcheia locals have gathered in a demo demanding the immediate retreat of the police from their area. According to the locals the policemen are extremely violent and bear no insignia of identification. Up to this moment the countdown is about 250 detentions which the persecuting authorities will decide if they are arrests within the next 24h, while protesters are gathering outside the Police HQ Tower demanding their release. At the same time, the State Persecutor has published a law-suit against the rector and the three sub-rectors of the Athens Polytechnic for allowing athens.indymedia to use its server. The law-suit is considered an unprecedented violation of academic freedom. In Salonica, three different protest marches in commemoration of the 1973 Uprising were marked again by massive participation. After the end of the march protesters attacked riot police forces outside the Aristotelian University building barricades across Egnatia street. In the city of Irakleion, in Crete, the Polytechnic protest march starting at Freedom Square and soon attacked riot police forces surrounding it. During the clashes 5 people were detained, out of which 1 has been upgraded to an arrest. More than 100 protesters have occupied the city hall as a response to the repression, demanding the immediate release of the comrades and the retreat of the cops from the city centre. 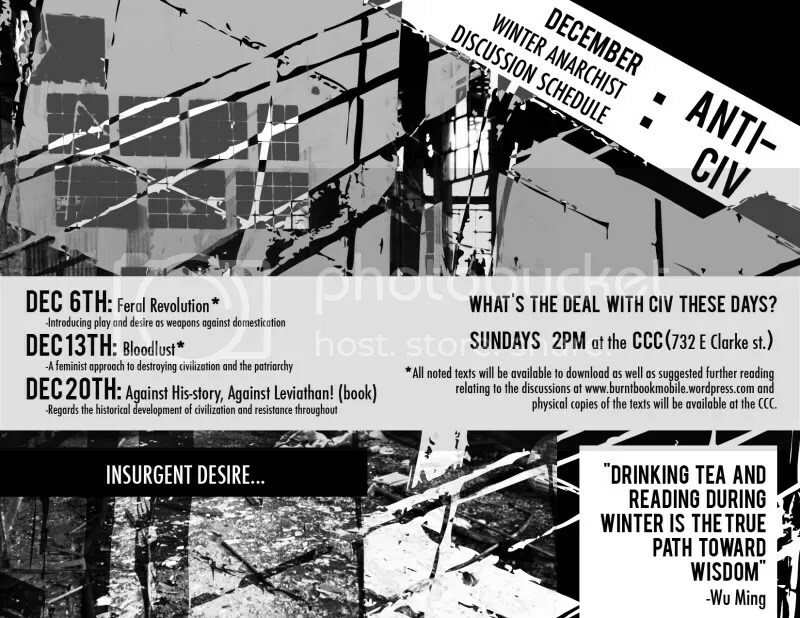 “With only weeks to go before December 6th, the day marking one year from the assassination of Alexis Grigoropoulos, two new excellent publications on the uprising of 2008 have come out by comrades in the UK and the US. In London, the good people at the 56a Infoshop have released “Everyone To The Streets: Communiques and Texts from the Streets and Occupations”. The book is 150 pages long (!) and contains an introduction by the 56a collective, two chronologies from Athens and Thessaloniki, 15+ texts and communiques from the streets and occupations plus analysis from Greek group TPTG and afterword.